2 The Olduvai theory has been called unthinkable, preposterous, absurd, dangerous, self-fulfilling, and self-defeating. However, as an inductive theory based on world energy and population data and on what I’ve seen during the past 30 years in some 50 nations on all continents except Antarctica. The theory is defined by the ratio of world energy production (use) and world population. The theory is easy. It states that the life expectancy of Industrial Civilization is from 1930 to 2030. 3 World energy production per capita from 1945 to 1973 grew at a breakneck speed of 3.45 %/year. Next from 1973 to the all-time peak in 1979, it slowed to a sluggish 0.64 %/year. 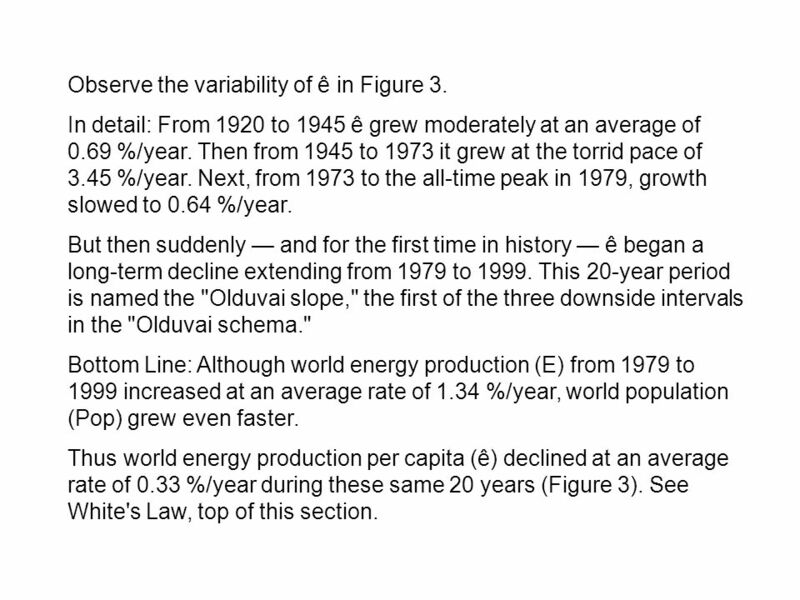 Then suddenly, and for the first time in history, energy production per capita took a long-term decline of 0.33 %/year from 1979 to The Olduvai theory explains the 1979 peak and the subsequent decline. 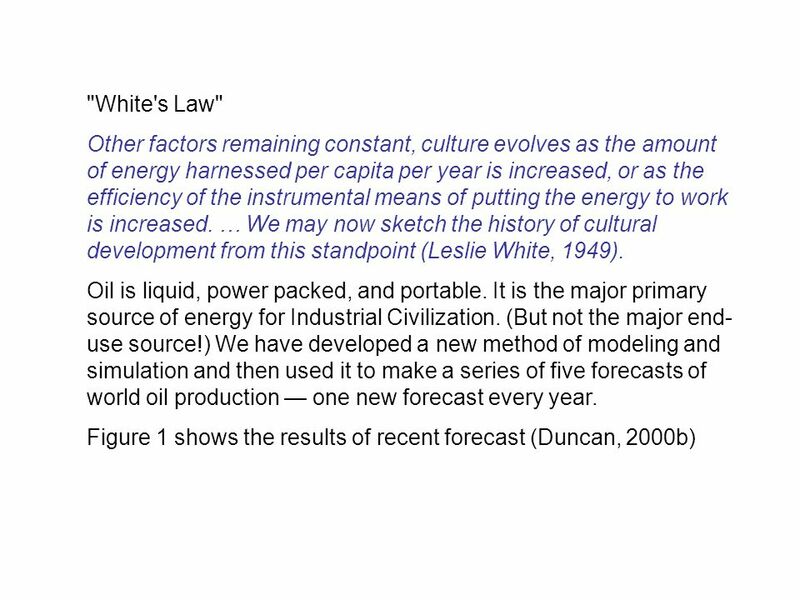 More to the point, it says that energy production per capita will fall to its 1930 value by 2030, thus giving Industrial Civilization a lifetime of less than or equal to 100 years. 4 Should this occur, any number of factors could be cited as the 'causes' of collapse. 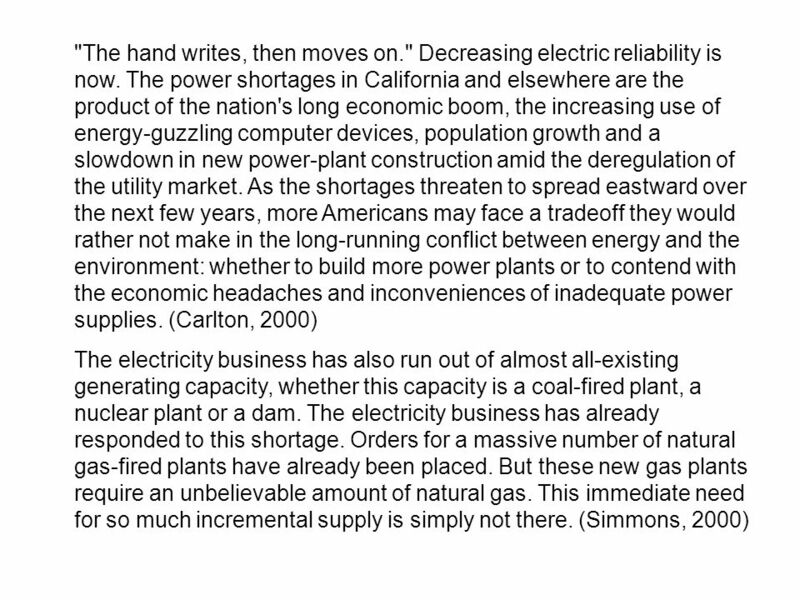 I believe, however, that the collapse will be strongly correlated with an 'epidemic' of permanent blackouts of high-voltage electric power networks — worldwide. Briefly explained: "When the electricity goes out, you are back in the Dark Age. And the Stone Age is just around the corner.“ The Olduvai theory, of course, may be proved wrong. But, as of now, it cannot be rejected by the historic world energy production and population data. 5 The Olduvai theory deals neither with the geology or the paleontology of the Olduvai Gorge. 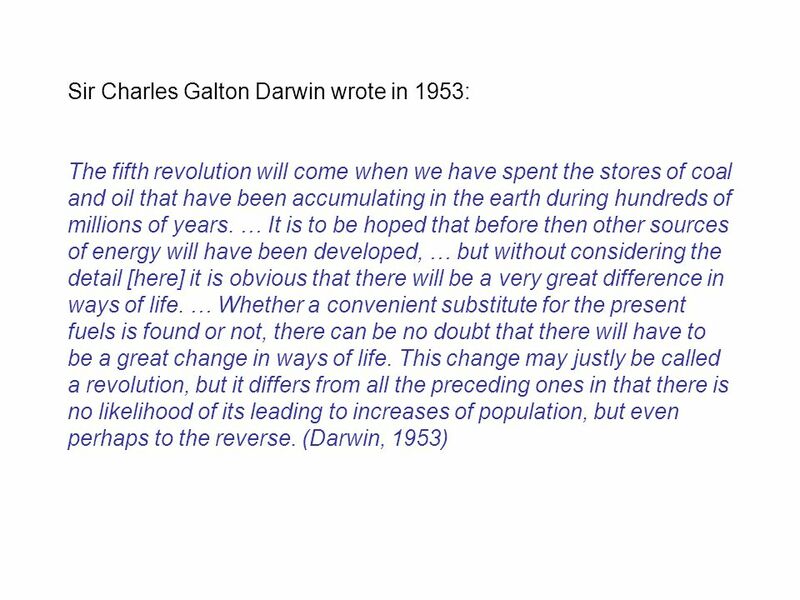 Rather, the theory simply attempts to explain the historic world energy production (and use) and population data in terms of overshoot and collapse. The name "Olduvai" because it is a good metaphor for the 'Stone Age way of life'. In fact, the Olduvai way of life was (and still is) a sustainable way of life — local, tribal, and solar — and, for better or worse, practiced it for millions of years. No doubt that the peak and decline of Industrial Civilization, should it occur, will be due to a complex matrix of causes, such as overpopulation, the depletion of nonrenewable resources, environmental damage, pollution, soil erosion, global warming, newly emerging viruses, and resource wars. 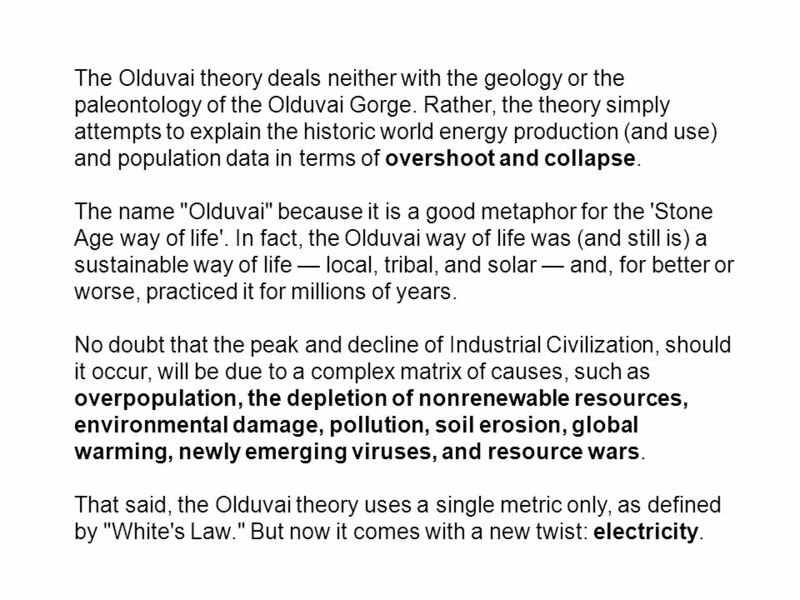 That said, the Olduvai theory uses a single metric only, as defined by "White's Law." But now it comes with a new twist: electricity. 6 Based on industrial experience in electric power networks and the energy management systems (EMS) that control them it can be said the following: Electricity is not a primary energy source, but rather an "energy carrier": zero mass, travels near the speed of light, and, for all practical purposes, it can't be stored. Moreover, electric power systems are costly, complex, voracious of fuel, polluting, and require 24h-7d-52w maintenance and operations. Another problem is that electricity is taken for granted. Just flip the switch and things happen. Electricity is the quintessence of the 'modern way of life', but the electric power systems are delicate and dangerous. 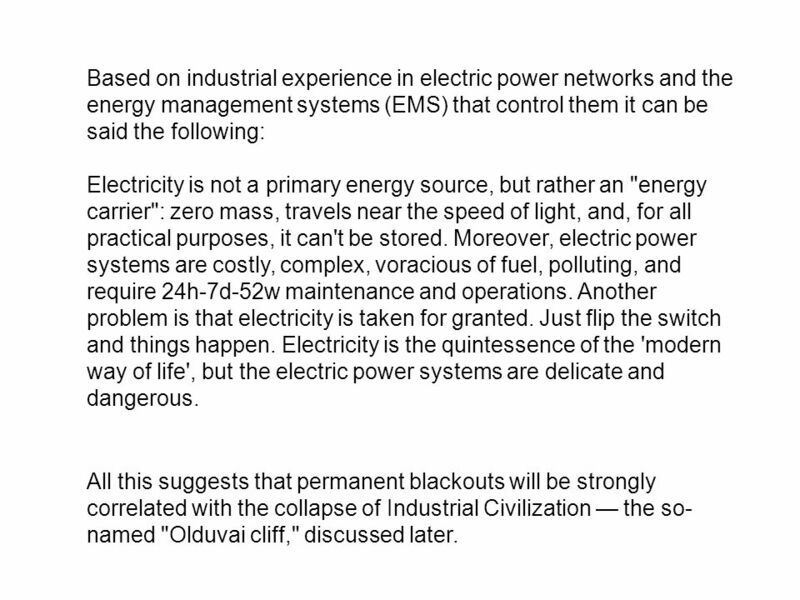 All this suggests that permanent blackouts will be strongly correlated with the collapse of Industrial Civilization — the so-named "Olduvai cliff," discussed later. 7 Definitions: ‘Oil’ (O) means crude oil and natural gas liquids. 'Energy' (E) means the primary sources of energy — specifically oil, gas, coal, and nuclear & hydropower. 'Pop' means world population. 'ô' means oil production per capita. 'ê' means energy production per capita. ‘G’ means billion (10^9). ‘b’ means barrels of oil. 'boe' means barrels of oil equivalent (energy content, not quality). 'J' means joule. 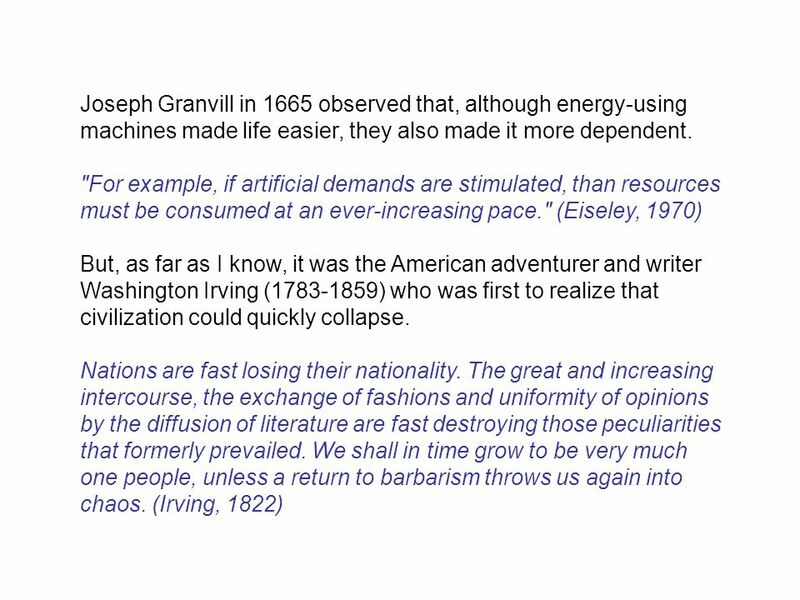 'Industrial Civilization' and 'Electrical Civilization', as we shall see, mean the same thing. Industrial Civilization is shown as a pulse-shaped curve of world average energy-use per capita (ê). The 'life expectancy' (i.e. 'duration') of Industrial Civilization is defined as the time (in years) between the upside point when ê reaches 30% of its peak value and the corresponding downside point when ê falls to the same value (Figure 4). 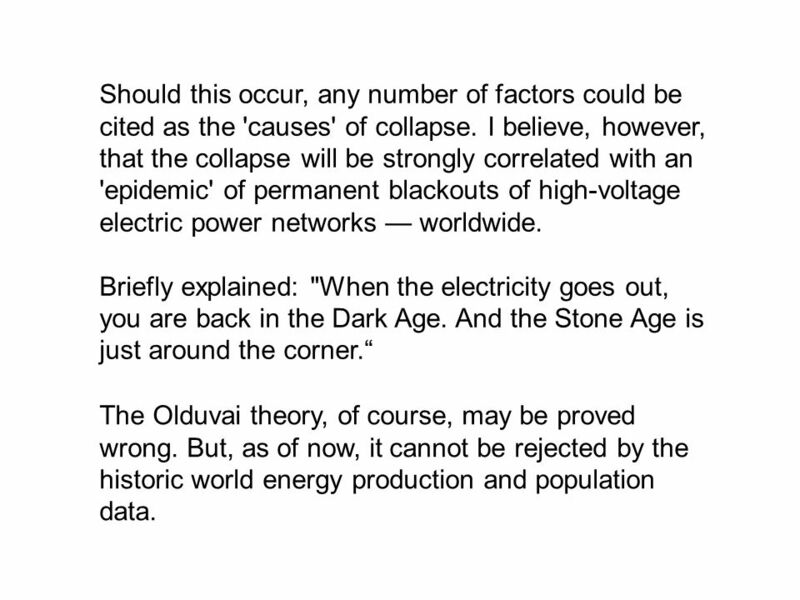 The new twist is that the Olduvai theory now focuses on the mounting problems with the high-voltage electric power networks — worldwide. 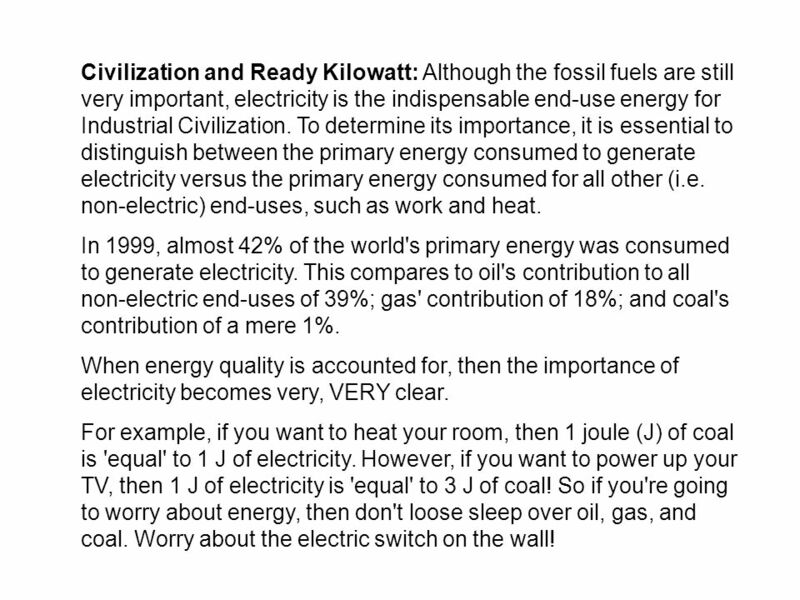 8 Civilization and Ready Kilowatt: Although the fossil fuels are still very important, electricity is the indispensable end-use energy for Industrial Civilization. To determine its importance, it is essential to distinguish between the primary energy consumed to generate electricity versus the primary energy consumed for all other (i.e. non-electric) end-uses, such as work and heat. In 1999, almost 42% of the world's primary energy was consumed to generate electricity. This compares to oil's contribution to all non-electric end-uses of 39%; gas' contribution of 18%; and coal's contribution of a mere 1%. When energy quality is accounted for, then the importance of electricity becomes very, VERY clear. For example, if you want to heat your room, then 1 joule (J) of coal is 'equal' to 1 J of electricity. However, if you want to power up your TV, then 1 J of electricity is 'equal' to 3 J of coal! So if you're going to worry about energy, then don't loose sleep over oil, gas, and coal. Worry about the electric switch on the wall! 10 Figure 1. World, OPEC, and Non-OPEC Oil Production. (1) World oil production is forecast to peak in (2) The OPEC/non-OPEC crossover event occurs in (3) The OPEC nations' rate of oil production from 1985 to 1999 increased by 9.33 times that of the non-OPEC nations. 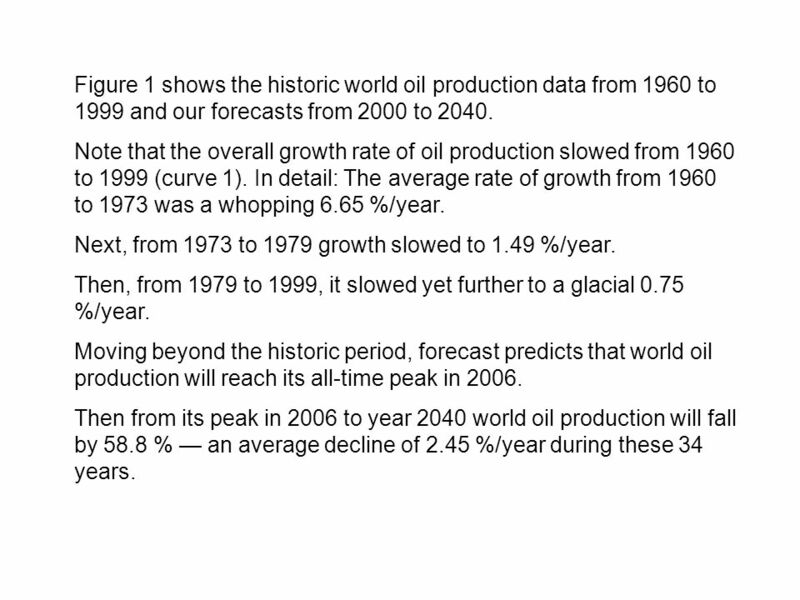 11 Figure 1 shows the historic world oil production data from 1960 to 1999 and our forecasts from 2000 to 2040. Note that the overall growth rate of oil production slowed from 1960 to 1999 (curve 1). In detail: The average rate of growth from 1960 to 1973 was a whopping 6.65 %/year. Next, from 1973 to 1979 growth slowed to 1.49 %/year. Then, from 1979 to 1999, it slowed yet further to a glacial 0.75 %/year. Moving beyond the historic period, forecast predicts that world oil production will reach its all-time peak in 2006. Then from its peak in 2006 to year 2040 world oil production will fall by 58.8 % — an average decline of 2.45 %/year during these 34 years. 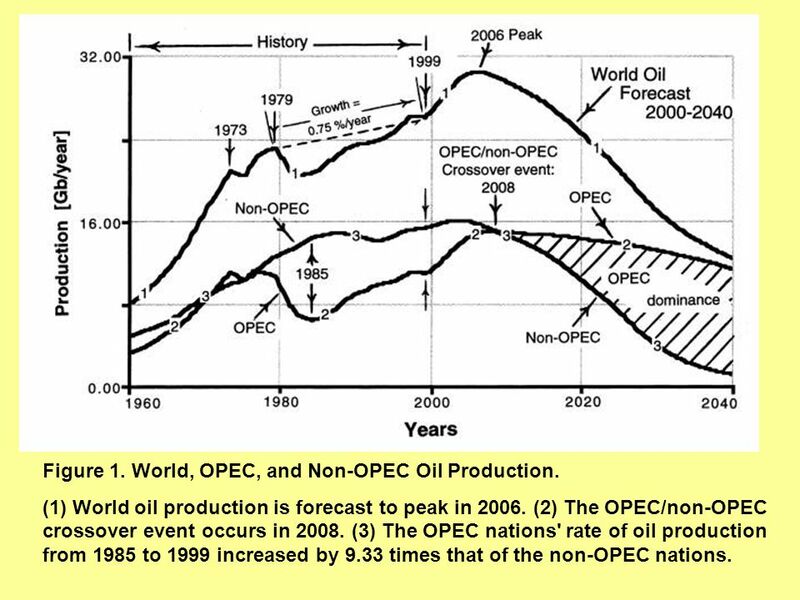 12 The OPEC/non-OPEC crossover event is predicted to occur in 2008 (Figure 1, curves 2 &3). This event will divide the world into two camps: one with surplus oil, the other with none. Forecast presents the following scenario: Beginning in 2008 the 11 OPEC nations will produce more than 50% of the world's oil. Thereafter OPEC will control nearly 100% of the world’s oil exports. BP Amoco (2000) puts OPEC's "proved reserves" at 77.6% of the world total. OPEC production from 1985 to 1999 grew at a strong average rate of 3.46 %/year. In contrast, non-OPEC production grew at sluggish 0.37 %/year during this same 14-year period. 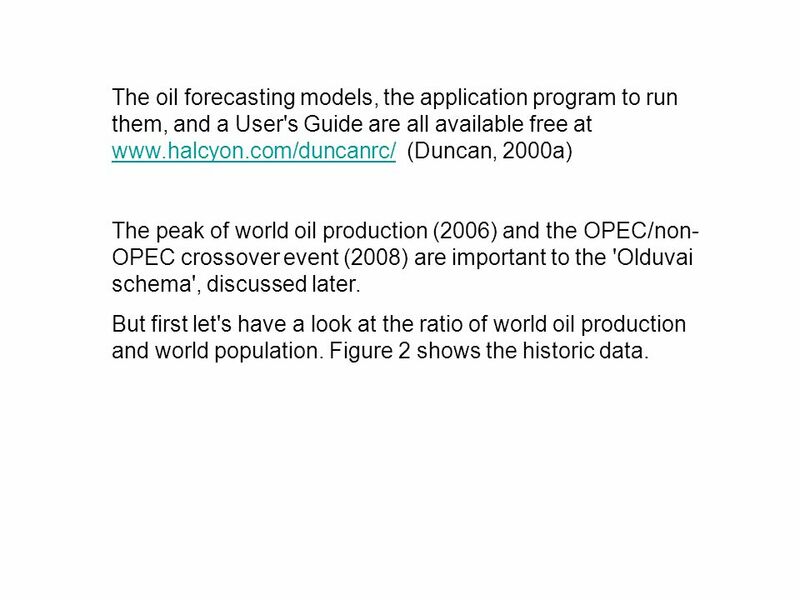 13 The oil forecasting models, the application program to run them, and a User's Guide are all available free at (Duncan, 2000a) The peak of world oil production (2006) and the OPEC/non-OPEC crossover event (2008) are important to the 'Olduvai schema', discussed later. But first let's have a look at the ratio of world oil production and world population. Figure 2 shows the historic data. 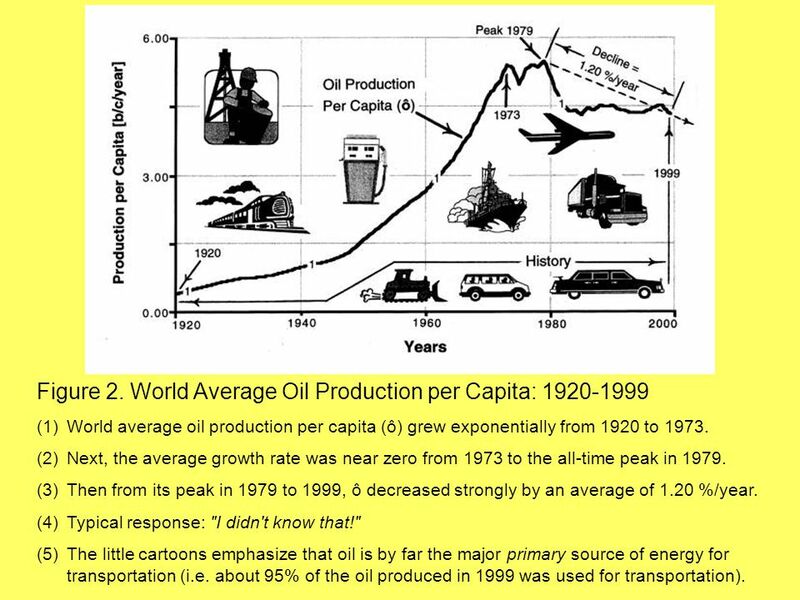 World average oil production per capita (ô) grew exponentially from 1920 to 1973. Next, the average growth rate was near zero from 1973 to the all-time peak in 1979. Then from its peak in 1979 to 1999, ô decreased strongly by an average of 1.20 %/year. Typical response: "I didn't know that!" The little cartoons emphasize that oil is by far the major primary source of energy for transportation (i.e. about 95% of the oil produced in 1999 was used for transportation). 15 Figure 2 shows the world average oil production per capita from 1920 to 1999. The curve represents the ratio of world oil production (O) and world population (Pop): i.e. ô = O/(Pop) in barrels per capita per year (i.e. b/c/year). Note well that ô grew exponentially from 1920 to Next, growth was negligible from 1973 to the all-time peak in Finally, from its peak in 1979 to 1999, ô decreased at an average rate of 1.20 %/year (i.e. from 5.50 b/c in 1979 to 4.32 b/c in 1999). "You've gotta be kidding!" 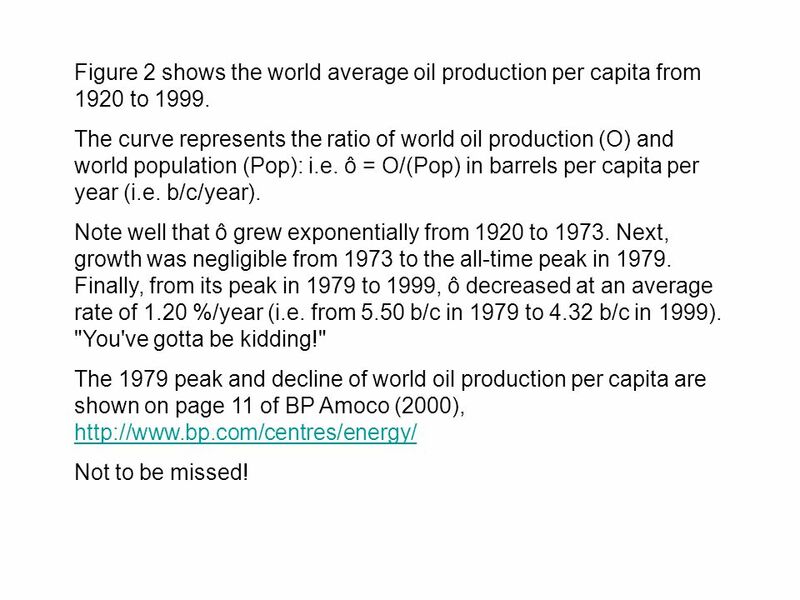 The 1979 peak and decline of world oil production per capita are shown on page 11 of BP Amoco (2000), Not to be missed! 16 Bottom Line: Although world oil production (O) from 1979 to 1999 increased at an average rate of 0.75 %/year (Figure 1), world population (Pop) grew even faster. Thus world oil production per capita (ô) declined at an average rate of 1.20 %/year during the 20 years from 1979 to 1999 (Figure 2). 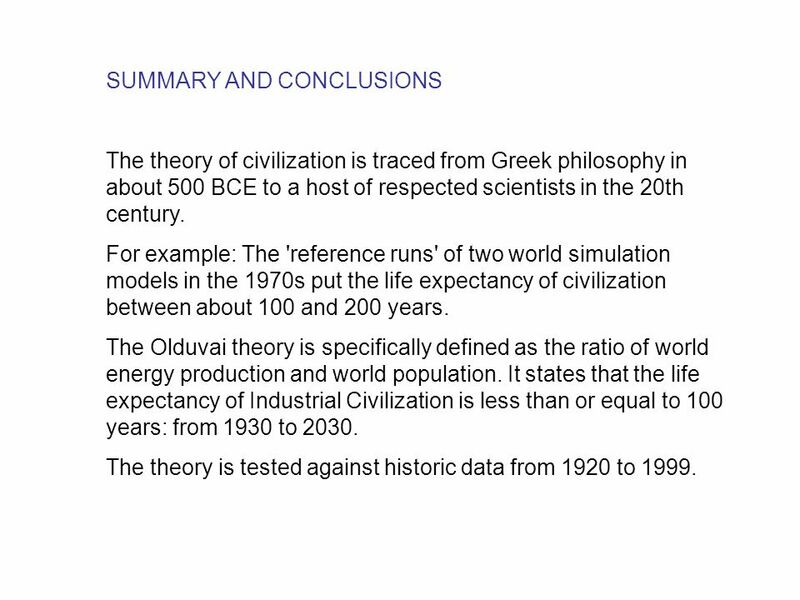 The main goals in this study, as was mentioned, are to describe, discuss, and test the Olduvai theory of Industrial Civilization against historic data. Applying White's Law, our metric (i.e. 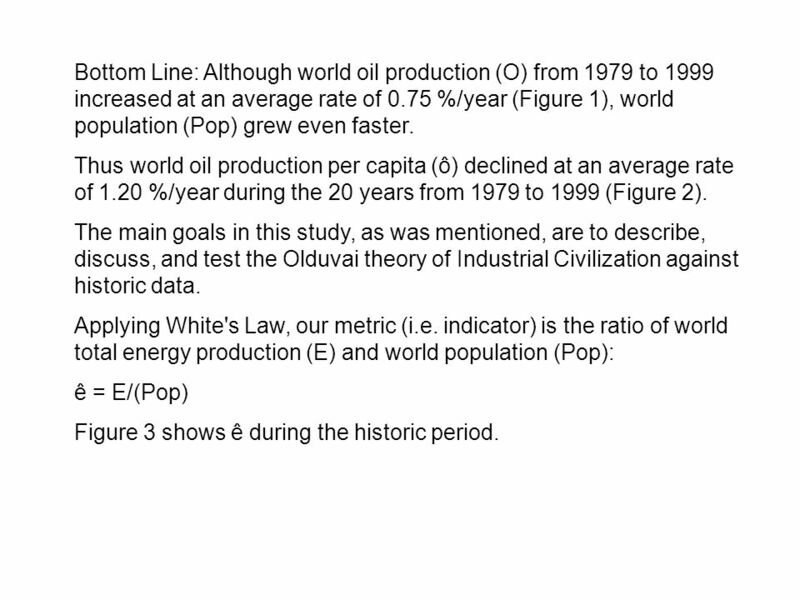 indicator) is the ratio of world total energy production (E) and world population (Pop): ê = E/(Pop) Figure 3 shows ê during the historic period. World average energy production per capita (ê) grew significantly from 1920 to its all-time peak in 1979. Then from its peak in 1979 to 1999, ê declined at an average rate of 0.33 %/year. This downward trend is the "Olduvai slope", discussed later. The tiny cartoons emphasize that the delivery of electricity to end-users is the sin quo non of the 'modern way of life'. Not hydrocarbons. 18 Observe the variability of ê in Figure 3. In detail: From 1920 to 1945 ê grew moderately at an average of 0.69 %/year. Then from 1945 to 1973 it grew at the torrid pace of 3.45 %/year. Next, from 1973 to the all-time peak in 1979, growth slowed to 0.64 %/year. But then suddenly — and for the first time in history — ê began a long-term decline extending from 1979 to This 20-year period is named the "Olduvai slope," the first of the three downside intervals in the "Olduvai schema." Bottom Line: Although world energy production (E) from 1979 to 1999 increased at an average rate of 1.34 %/year, world population (Pop) grew even faster. Thus world energy production per capita (ê) declined at an average rate of 0.33 %/year during these same 20 years (Figure 3). See White's Law, top of this section. 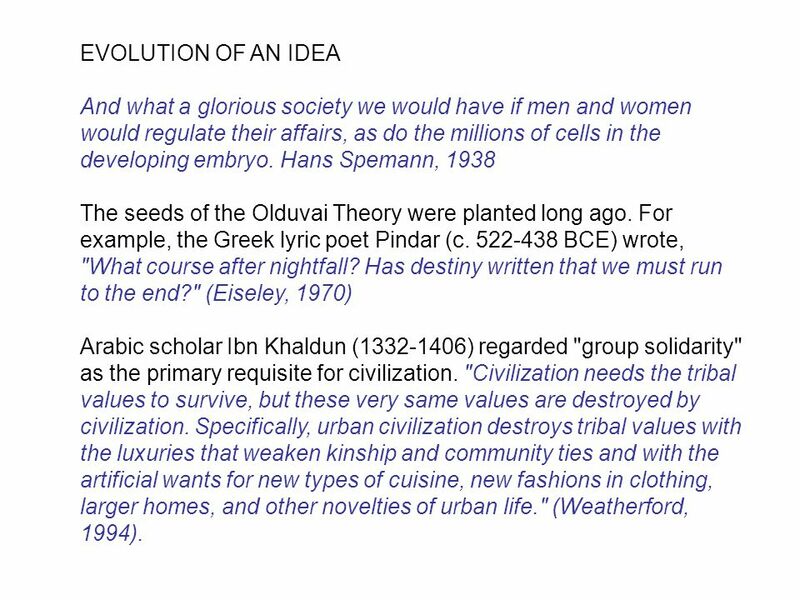 20 EVOLUTION OF AN IDEA And what a glorious society we would have if men and women would regulate their affairs, as do the millions of cells in the developing embryo. Hans Spemann, 1938 The seeds of the Olduvai Theory were planted long ago. For example, the Greek lyric poet Pindar (c BCE) wrote, "What course after nightfall? Has destiny written that we must run to the end?" (Eiseley, 1970) Arabic scholar Ibn Khaldun ( ) regarded "group solidarity" as the primary requisite for civilization. "Civilization needs the tribal values to survive, but these very same values are destroyed by civilization. Specifically, urban civilization destroys tribal values with the luxuries that weaken kinship and community ties and with the artificial wants for new types of cuisine, new fashions in clothing, larger homes, and other novelties of urban life." (Weatherford, 1994). 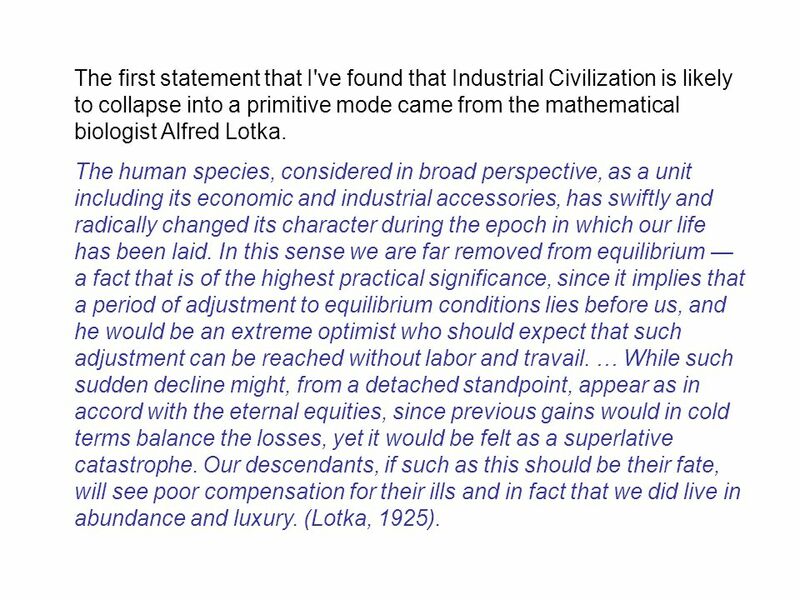 22 The first statement that I've found that Industrial Civilization is likely to collapse into a primitive mode came from the mathematical biologist Alfred Lotka. The human species, considered in broad perspective, as a unit including its economic and industrial accessories, has swiftly and radically changed its character during the epoch in which our life has been laid. In this sense we are far removed from equilibrium — a fact that is of the highest practical significance, since it implies that a period of adjustment to equilibrium conditions lies before us, and he would be an extreme optimist who should expect that such adjustment can be reached without labor and travail. … While such sudden decline might, from a detached standpoint, appear as in accord with the eternal equities, since previous gains would in cold terms balance the losses, yet it would be felt as a superlative catastrophe. Our descendants, if such as this should be their fate, will see poor compensation for their ills and in fact that we did live in abundance and luxury. (Lotka, 1925). 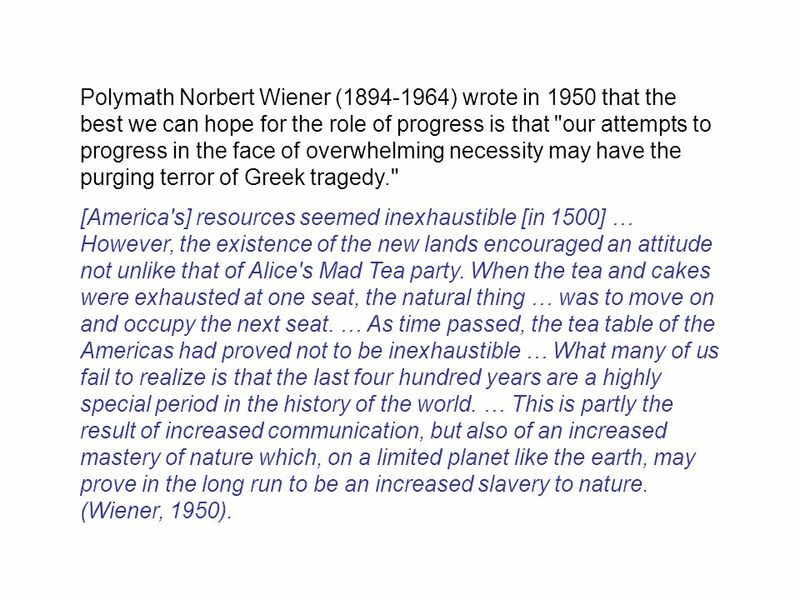 23 Polymath Norbert Wiener ( ) wrote in 1950 that the best we can hope for the role of progress is that "our attempts to progress in the face of overwhelming necessity may have the purging terror of Greek tragedy." [America's] resources seemed inexhaustible [in 1500] … However, the existence of the new lands encouraged an attitude not unlike that of Alice's Mad Tea party. When the tea and cakes were exhausted at one seat, the natural thing … was to move on and occupy the next seat. … As time passed, the tea table of the Americas had proved not to be inexhaustible … What many of us fail to realize is that the last four hundred years are a highly special period in the history of the world. … This is partly the result of increased communication, but also of an increased mastery of nature which, on a limited planet like the earth, may prove in the long run to be an increased slavery to nature. (Wiener, 1950). 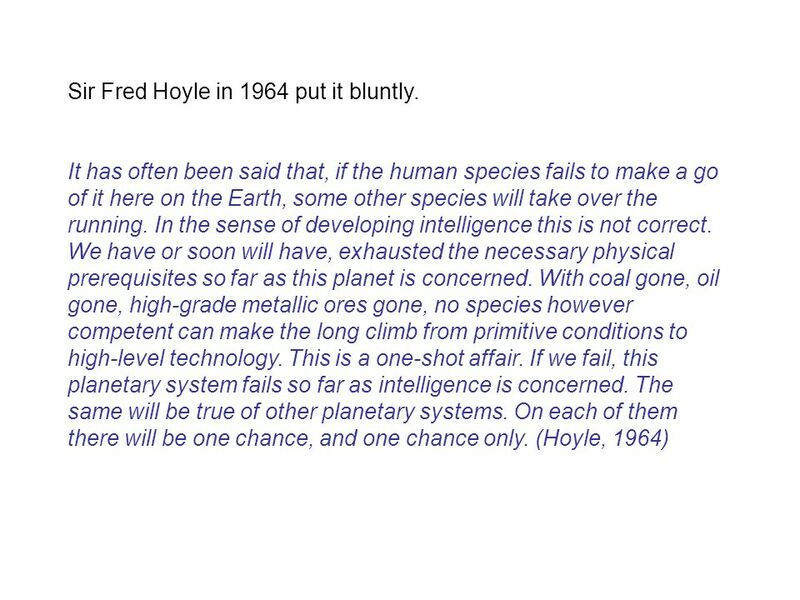 25 Sir Fred Hoyle in 1964 put it bluntly. Critics (mostly economists) argued that such policies were e.g. "blue sky" and "unrealistic". Fortunately, the project team was just then completing a two-year study using the more comprehensive 'World3' model. 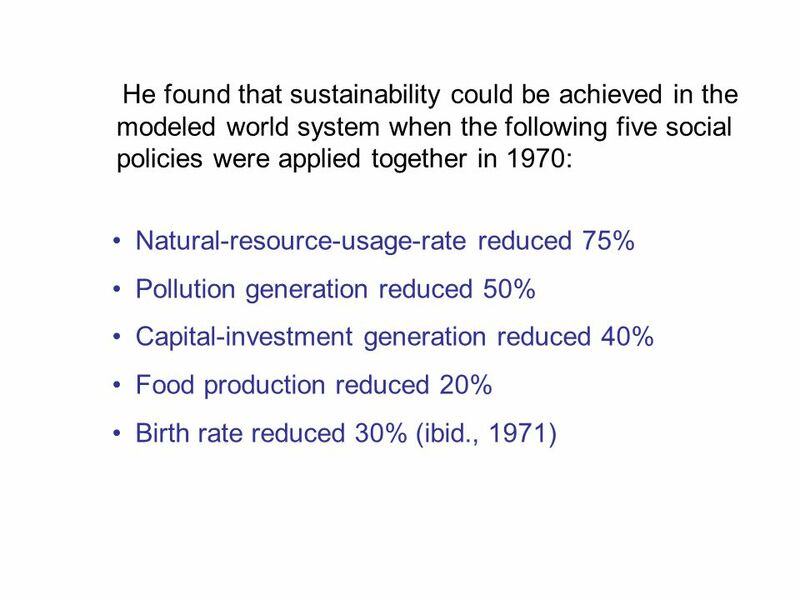 They too searched for social policies that might achieve sustainability in the world system. 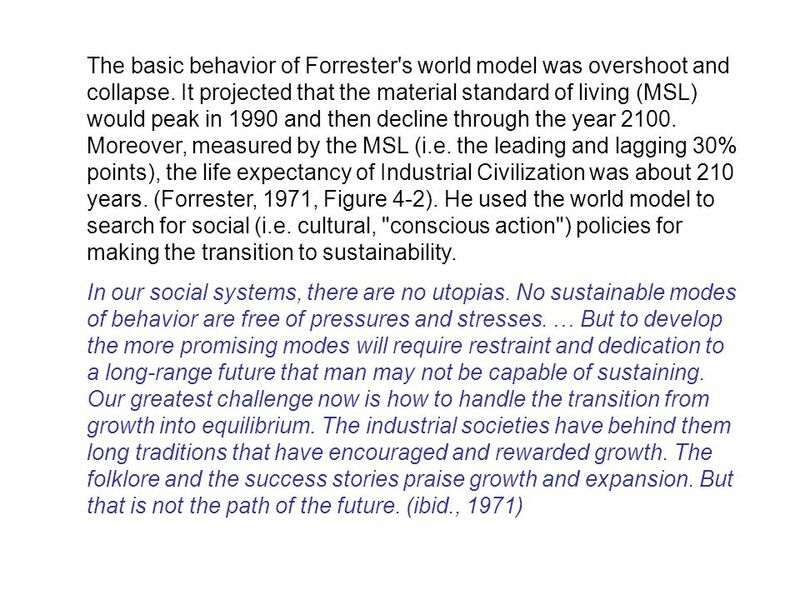 However, the World3 'reference run' (like Forrester's in 1971) also projected overshoot and collapse of the world system. This is the World3 reference run, …. Both population POP and industrial output per capita IOPC grow beyond sustainable levels and subsequently decline. The cause of their decline is traceable to the depletion of nonrenewable resources. 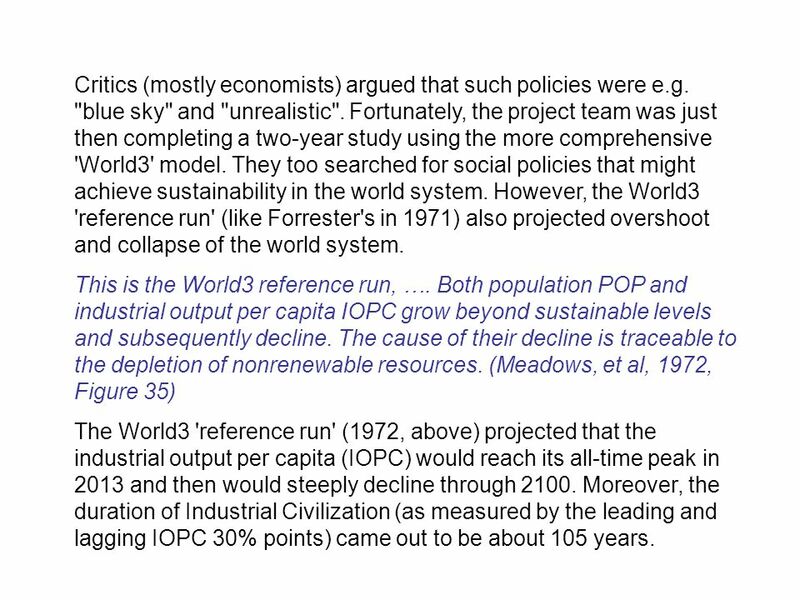 (Meadows, et al, 1972, Figure 35) The World3 'reference run' (1972, above) projected that the industrial output per capita (IOPC) would reach its all-time peak in 2013 and then would steeply decline through Moreover, the duration of Industrial Civilization (as measured by the leading and lagging IOPC 30% points) came out to be about 105 years. 31 I first presented the Olduvai theory to the public in 1989. The broad sweep of human history can be divided into three phases. The first, or pre-industrial phase was a very long period of equilibrium when simple tools and weak machines limited economic growth. The second, or industrial phase was a very short period of non-equilibrium that ignited with explosive force when powerful new machines temporarily lifted all limits to growth. 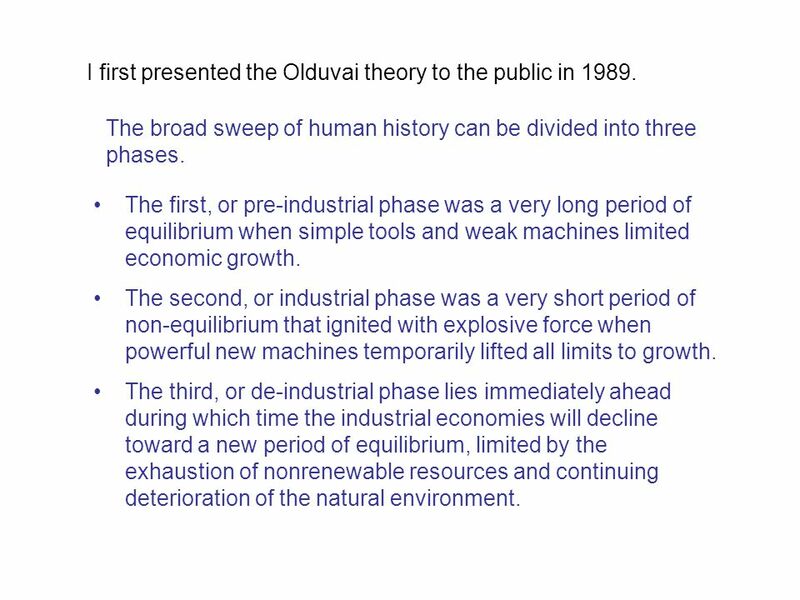 The third, or de-industrial phase lies immediately ahead during which time the industrial economies will decline toward a new period of equilibrium, limited by the exhaustion of nonrenewable resources and continuing deterioration of the natural environment. 32 In 1992, twenty years after the first World3 study, the team members re-calibrated the model with the latest data and used it to help "envision a sustainable future." But — All that World3 has told us so far is that the model system, and by implication the "real world" system, has a strong tendency to overshoot and collapse. In fact, in the thousands of model runs we have tried over the years, overshoot and collapse has been by far the most frequent outcome. 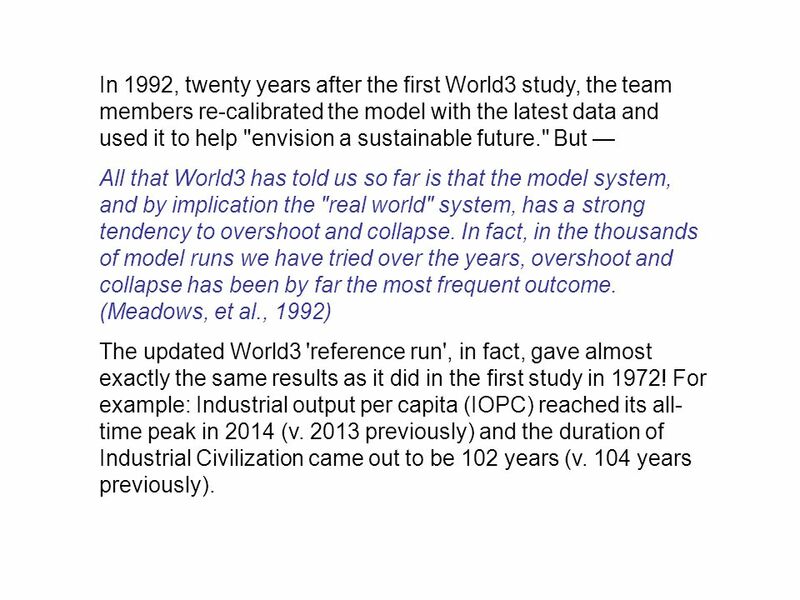 (Meadows, et al., 1992) The updated World3 'reference run', in fact, gave almost exactly the same results as it did in the first study in 1972! For example: Industrial output per capita (IOPC) reached its all-time peak in 2014 (v previously) and the duration of Industrial Civilization came out to be 102 years (v. 104 years previously). 34 THE OLDUVAI THEORY: The earth's immune system, so to speak, has recognized the presence of the human species and is starting to kick in. The earth is attempting to rid itself of an infection by the human parasite. 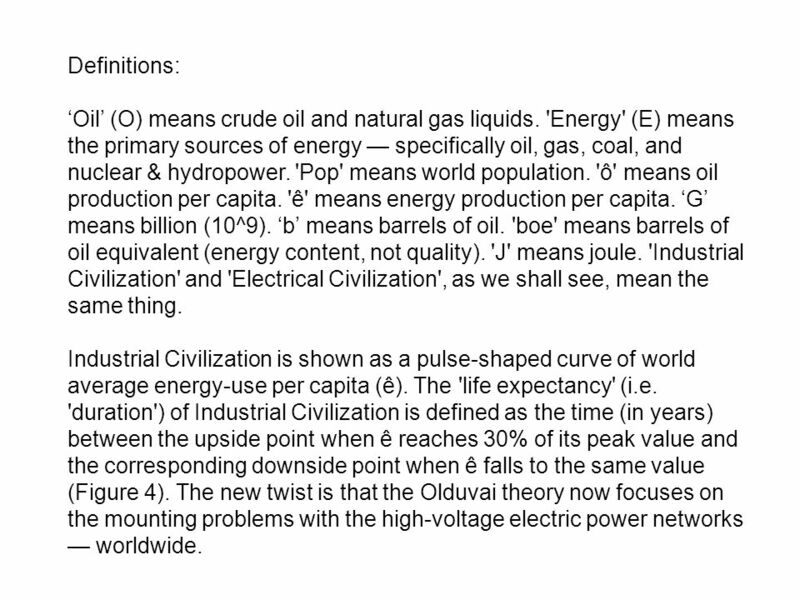 Richard Preston, 1994 The Olduvai theory, to review, states that the life expectancy of Industrial Civilization is less than or equal to one hundred years, as measured by the world average energy production person per year: ê = E/(Pop). Industrial Civilization, defined herein, began in 1930 and is predicted to end on or before the year 2030. 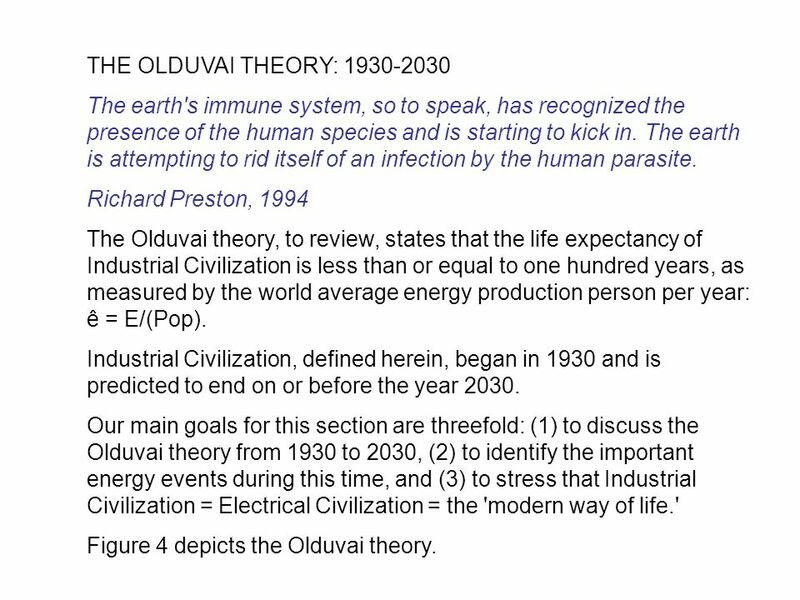 Our main goals for this section are threefold: (1) to discuss the Olduvai theory from 1930 to 2030, (2) to identify the important energy events during this time, and (3) to stress that Industrial Civilization = Electrical Civilization = the 'modern way of life.' Figure 4 depicts the Olduvai theory. 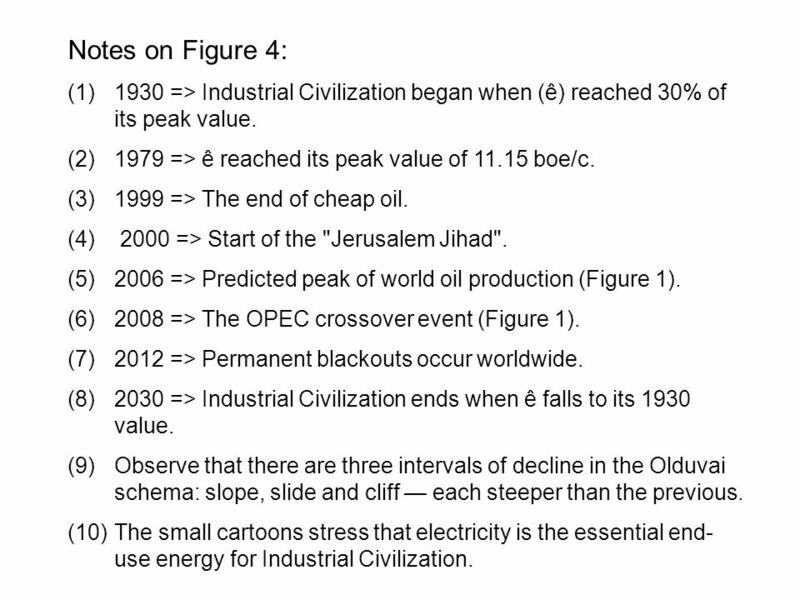 36 Notes on Figure 4: 1930 => Industrial Civilization began when (ê) reached 30% of its peak value. 1979 => ê reached its peak value of boe/c. 1999 => The end of cheap oil. 2000 => Start of the "Jerusalem Jihad". 2006 => Predicted peak of world oil production (Figure 1). 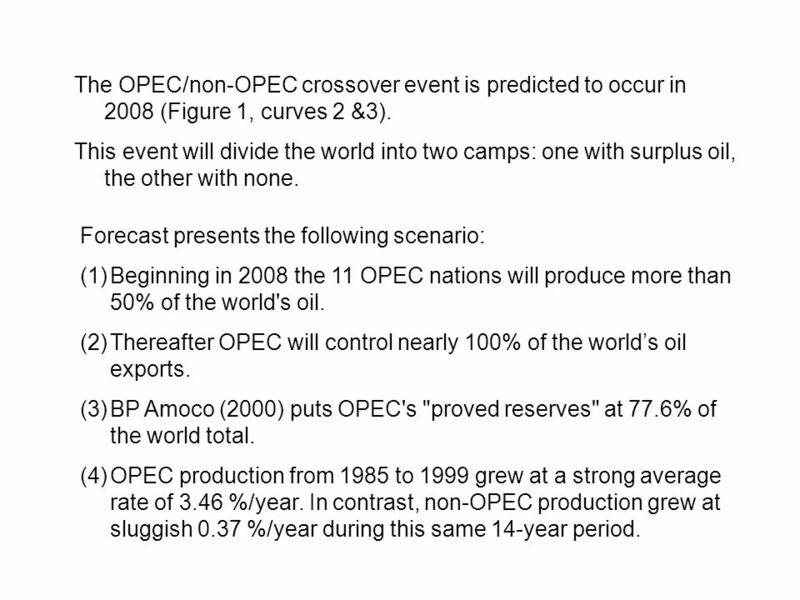 2008 => The OPEC crossover event (Figure 1). 2012 => Permanent blackouts occur worldwide. 2030 => Industrial Civilization ends when ê falls to its 1930 value. Observe that there are three intervals of decline in the Olduvai schema: slope, slide and cliff — each steeper than the previous. The small cartoons stress that electricity is the essential end-use energy for Industrial Civilization. 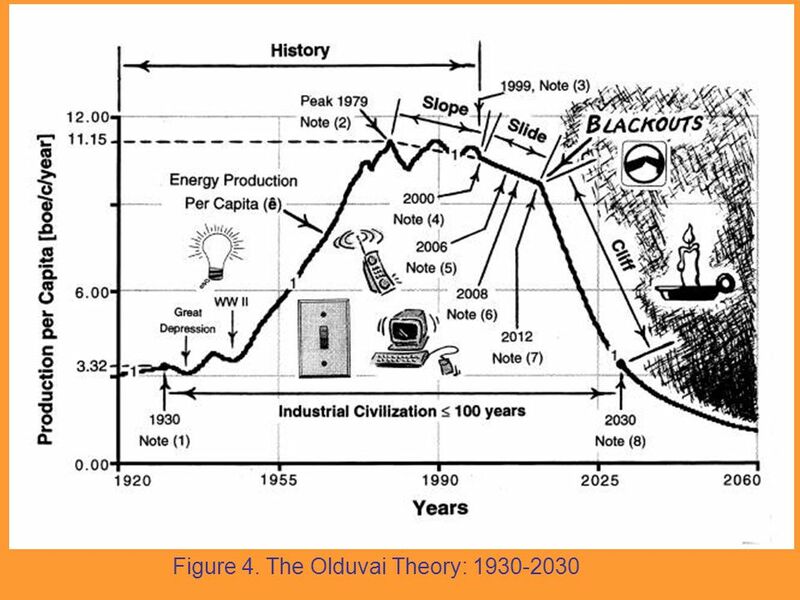 Figure 4 shows the complete Olduvai curve from 1930 to Historic data appears from 1930 to 1999 and hypothetical values from 2000 to These 100 years are labeled "Industrial Civilization." The curve and the events together constitute the "Olduvai schema." Observe that the overall curve has a pulse-like waveform — namely overshoot and collapse. 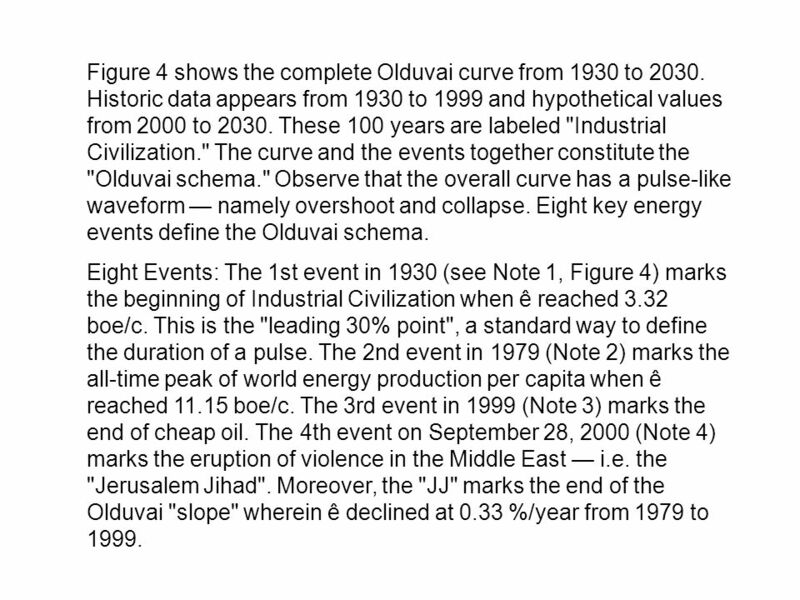 Eight key energy events define the Olduvai schema. Eight Events: The 1st event in 1930 (see Note 1, Figure 4) marks the beginning of Industrial Civilization when ê reached 3.32 boe/c. This is the "leading 30% point", a standard way to define the duration of a pulse. 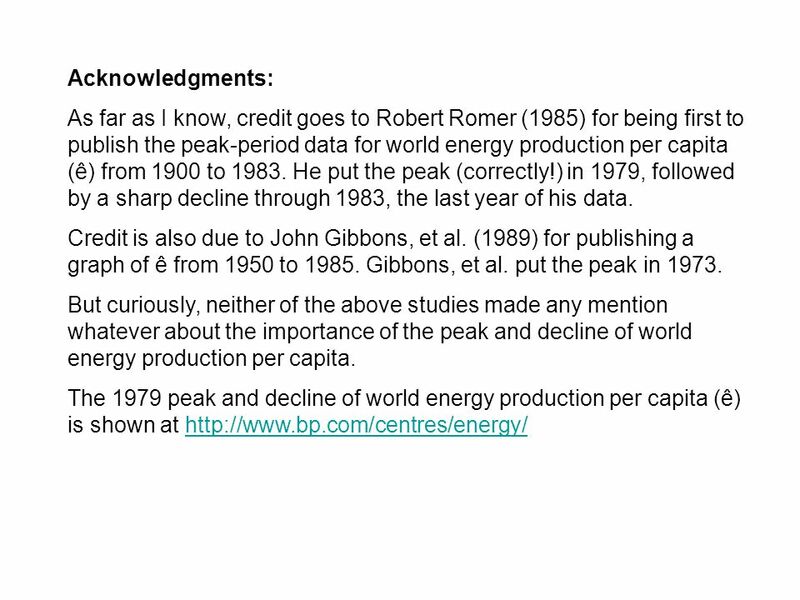 The 2nd event in 1979 (Note 2) marks the all-time peak of world energy production per capita when ê reached boe/c. The 3rd event in 1999 (Note 3) marks the end of cheap oil. The 4th event on September 28, 2000 (Note 4) marks the eruption of violence in the Middle East — i.e. the "Jerusalem Jihad". Moreover, the "JJ" marks the end of the Olduvai "slope" wherein ê declined at 0.33 %/year from 1979 to 1999. Next in Figure 4 we come the future intervals in the Olduvai schema. 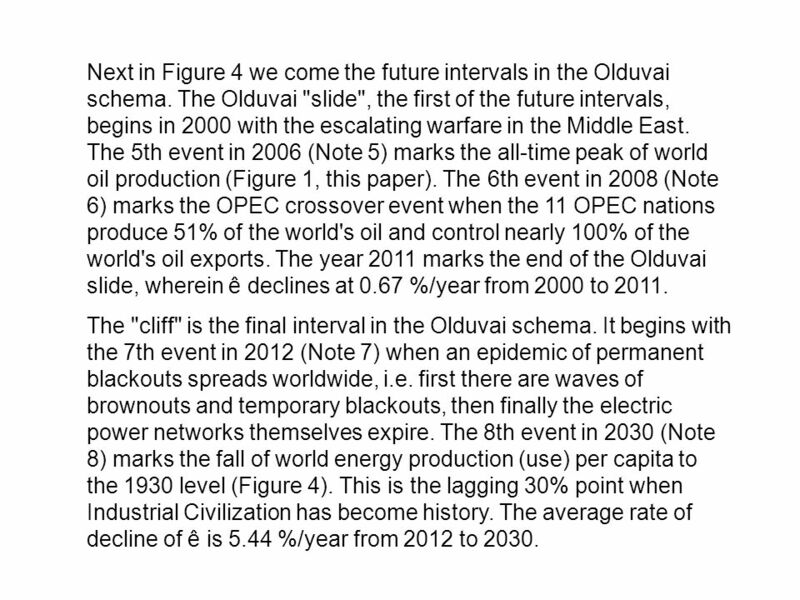 The Olduvai "slide", the first of the future intervals, begins in 2000 with the escalating warfare in the Middle East. 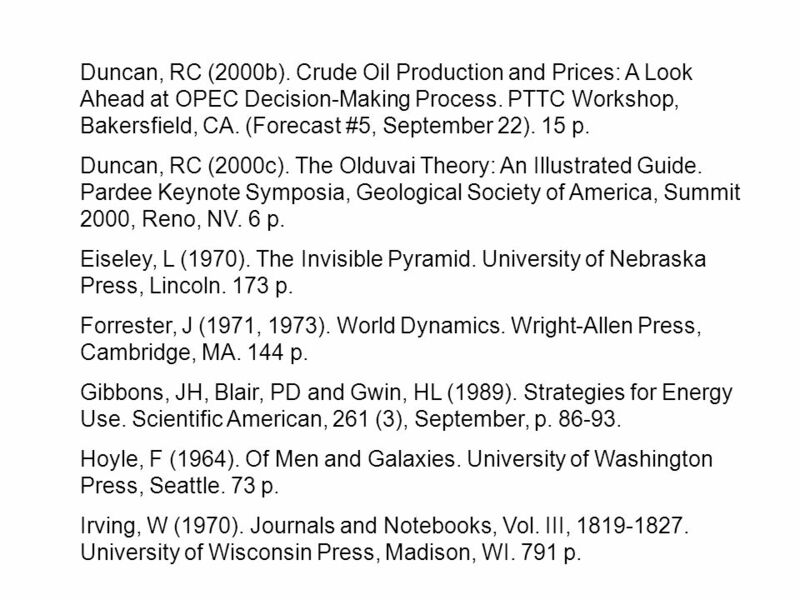 The 5th event in 2006 (Note 5) marks the all-time peak of world oil production (Figure 1, this paper). The 6th event in 2008 (Note 6) marks the OPEC crossover event when the 11 OPEC nations produce 51% of the world's oil and control nearly 100% of the world's oil exports. The year 2011 marks the end of the Olduvai slide, wherein ê declines at 0.67 %/year from 2000 to 2011. The "cliff" is the final interval in the Olduvai schema. It begins with the 7th event in 2012 (Note 7) when an epidemic of permanent blackouts spreads worldwide, i.e. first there are waves of brownouts and temporary blackouts, then finally the electric power networks themselves expire. 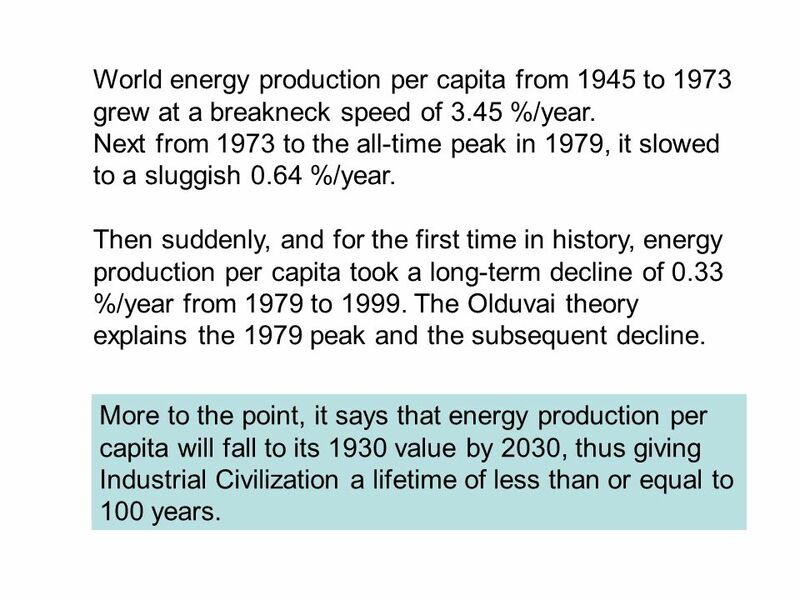 The 8th event in 2030 (Note 8) marks the fall of world energy production (use) per capita to the 1930 level (Figure 4). This is the lagging 30% point when Industrial Civilization has become history. The average rate of decline of ê is 5.44 %/year from 2012 to 2030. 40 As we have emphasized, Industrial Civilization is beholden to electricity. Namely: In 1999, electricity supplied 42% (and counting) of the world's end-use energy versus 39% for oil (the leading fossil fuel). Yet the small difference of 3% obscures the real magnitude of the problem because it omits the quality of the different forms of end-use energy. With apologies to George Orwell and the 2nd Law of Thermodynamics — "All joules (J) of energy are equal. But some joules are more equal than others." Thus, if you just want to heat your coffee, then 1 J of oil energy works just as well as 1 J of electrical energy. However, if you want to power up your computer, then 1 J of electricity is worth 3 J of oil. 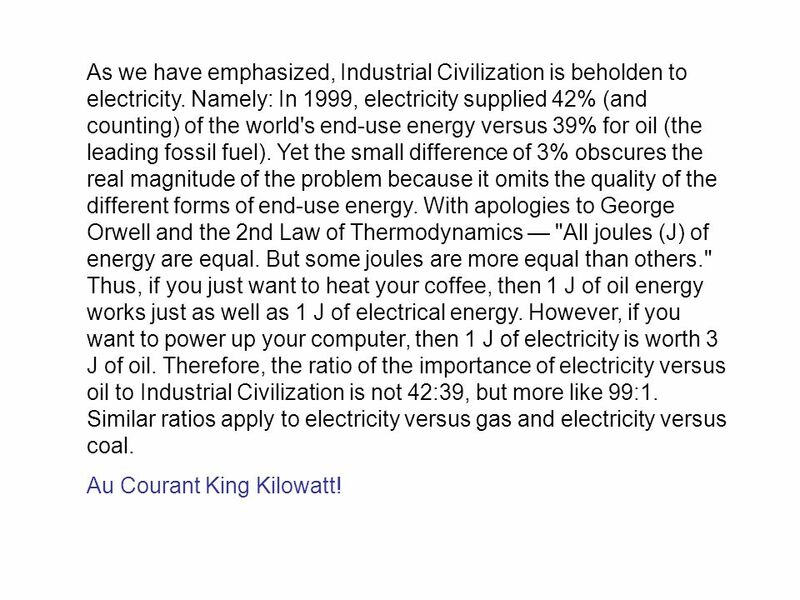 Therefore, the ratio of the importance of electricity versus oil to Industrial Civilization is not 42:39, but more like 99:1. Similar ratios apply to electricity versus gas and electricity versus coal. Au Courant King Kilowatt! 41 Question: Where will the Olduvai die-off occur? Response: Everywhere. But large cities, of course, will be the most dangerous places to reside when the electric grids die. There you have millions of people densely packed in high-rise buildings, surrounded by acres-and-acres of blacktop and concrete: no electricity, no work, and no food. Thus the urban areas will rapidly depopulate when the electric grids die. In fact we have already mapped out the danger zones. (e.g. See Living Earth, 1996.) Specifically: The big cities stand out brightly as yellow-orange dots on NASA's satellite mosaics (i.e. pictures) of the earth at night. These planetary lights blare out "Beware", "Warning", and "Danger". The likes of Los Angeles and New York, London and Paris, Bombay and Hong Kong are all unsustainable hot spots. The theory of civilization is traced from Greek philosophy in about 500 BCE to a host of respected scientists in the 20th century. 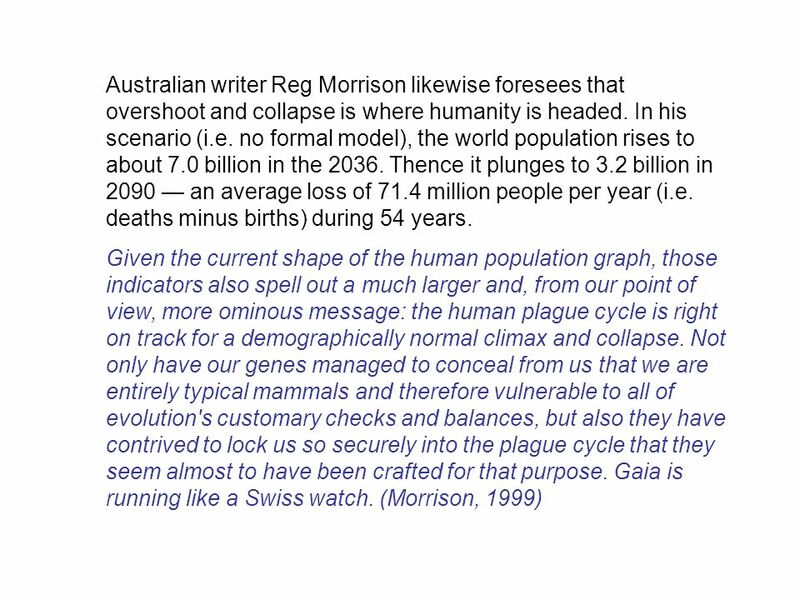 For example: The 'reference runs' of two world simulation models in the 1970s put the life expectancy of civilization between about 100 and 200 years. 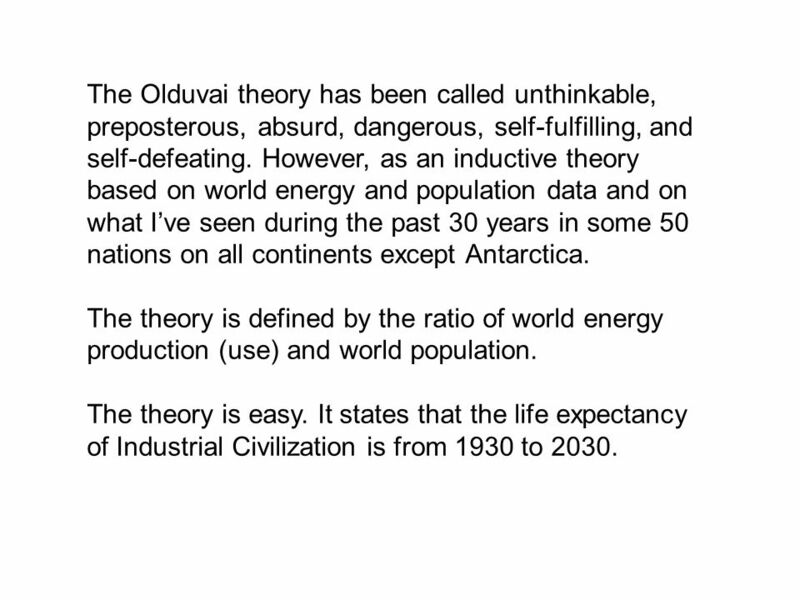 The Olduvai theory is specifically defined as the ratio of world energy production and world population. It states that the life expectancy of Industrial Civilization is less than or equal to 100 years: from 1930 to 2030. The theory is tested against historic data from 1920 to 1999. 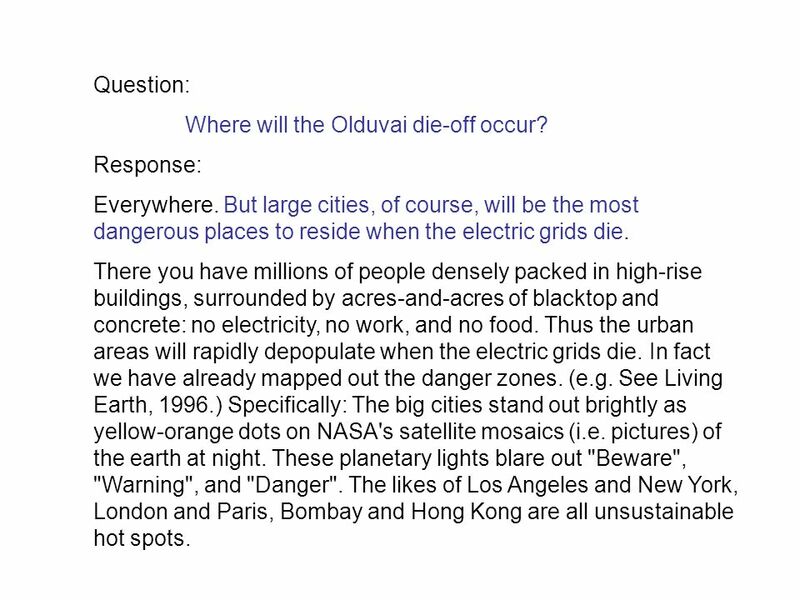 Although all primary sources of energy are important, the Olduvai theory postulates that electricity is the quintessence of Industrial Civilization. 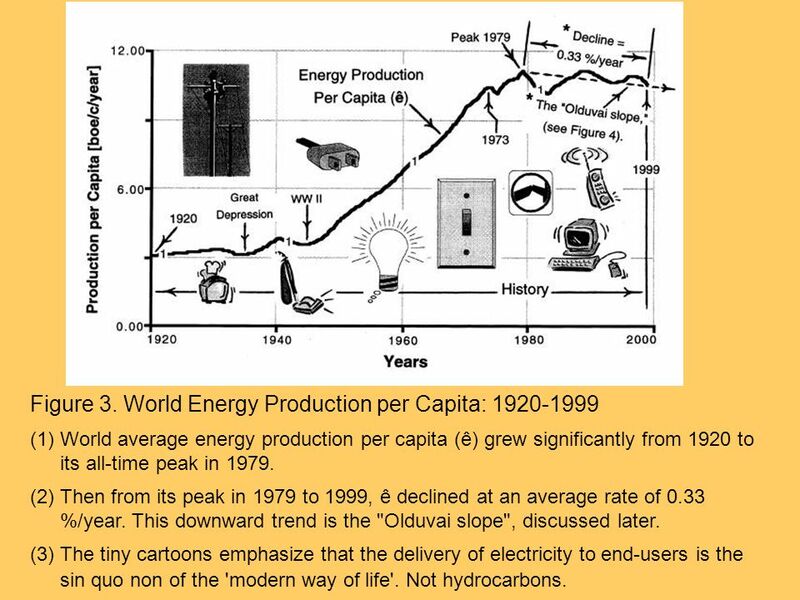 World energy production per capita increased strongly from 1945 to its all-time peak in Then from 1979 to 1999 — for the first time in history — it decreased from 1979 to 1999 at a rate of 0.33 %/year (the Olduvai 'slope', Figure 4). Next from 2000 to 2011, according to the Olduvai schema, world energy production per capita will decrease by about 0.70 %/year (the 'slide'). Then around year 2012 there will be a rash of permanent electrical blackouts — worldwide. 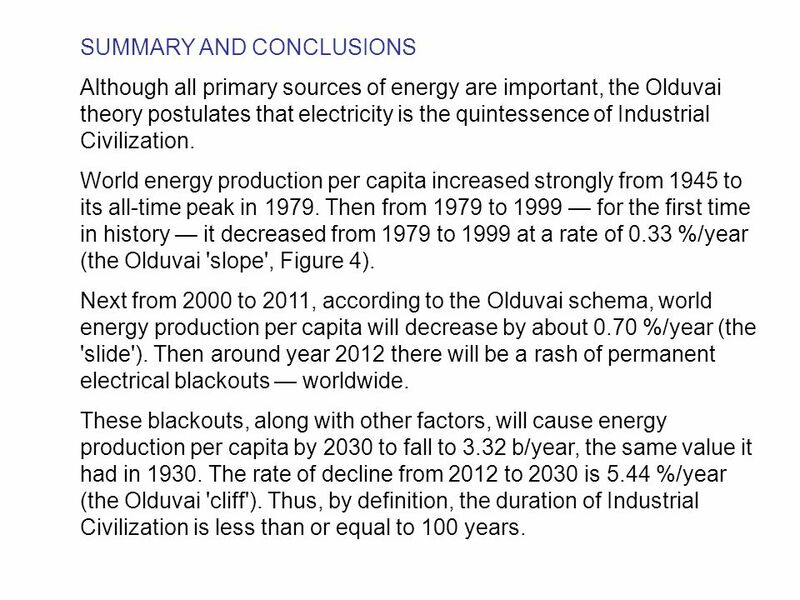 These blackouts, along with other factors, will cause energy production per capita by 2030 to fall to 3.32 b/year, the same value it had in The rate of decline from 2012 to 2030 is 5.44 %/year (the Olduvai 'cliff'). Thus, by definition, the duration of Industrial Civilization is less than or equal to 100 years. The Olduvai 'slide' from 2001 to 2011 (Figure 4) may resemble the "Great Depression" of 1929 to 1939: unemployment, breadlines, and homelessness. 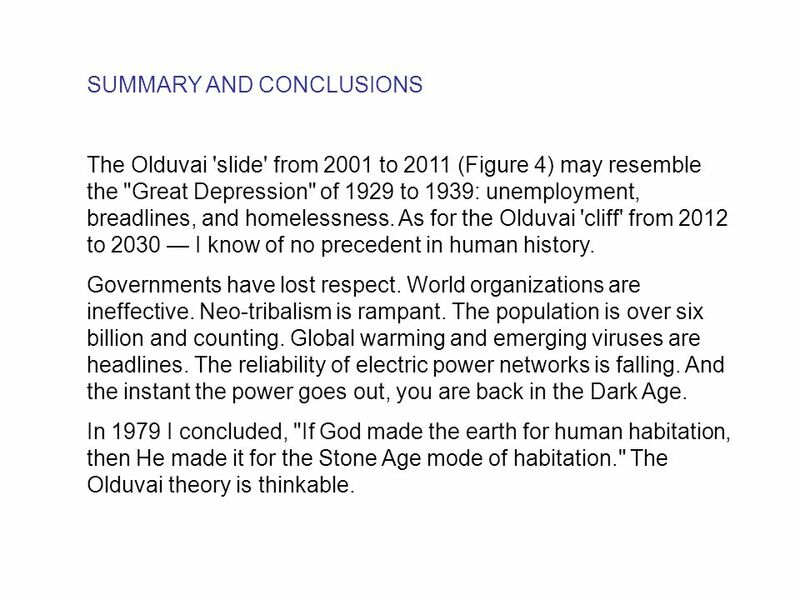 As for the Olduvai 'cliff' from 2012 to 2030 — I know of no precedent in human history. Governments have lost respect. World organizations are ineffective. Neo-tribalism is rampant. The population is over six billion and counting. Global warming and emerging viruses are headlines. The reliability of electric power networks is falling. And the instant the power goes out, you are back in the Dark Age. In 1979 I concluded, "If God made the earth for human habitation, then He made it for the Stone Age mode of habitation." The Olduvai theory is thinkable. 45 REFERENCES BPAmoco (2000). BP Amoco Statistical Review of World Energy ( ). BP Amoco, London. Carlton, J (2000). An Electricity Crunch May Force the Nation into Tough Tradeoffs. Wall Street Journal (October 10). p. A1. Darwin, CG (1953). The Next Million Years. Doubleday, Garden City, NY. 210 p. Duncan, RC (1989). Evolution, Technology, and the Natural Environment: A Unified Theory of Human History. Proceedings of the St. Lawrence Section ASEE Annual Meeting, Binghamton, NY. 14B1-11 to 14B1-20. Duncan, RC (2000a). The Heuristic Oil Forecasting Method: User's Guide & Forecast #4. (Forecast #4). 30 p.
46 Duncan, RC (2000b). Crude Oil Production and Prices: A Look Ahead at OPEC Decision-Making Process. PTTC Workshop, Bakersfield, CA. (Forecast #5, September 22). 15 p. Duncan, RC (2000c). The Olduvai Theory: An Illustrated Guide. Pardee Keynote Symposia, Geological Society of America, Summit 2000, Reno, NV. 6 p. Eiseley, L (1970). The Invisible Pyramid. University of Nebraska Press, Lincoln. 173 p. Forrester, J (1971, 1973). World Dynamics. Wright-Allen Press, Cambridge, MA. 144 p. Gibbons, JH, Blair, PD and Gwin, HL (1989). Strategies for Energy Use. Scientific American, 261 (3), September, p Hoyle, F (1964). Of Men and Galaxies. University of Washington Press, Seattle. 73 p. Irving, W (1970). Journals and Notebooks, Vol. III, University of Wisconsin Press, Madison, WI. 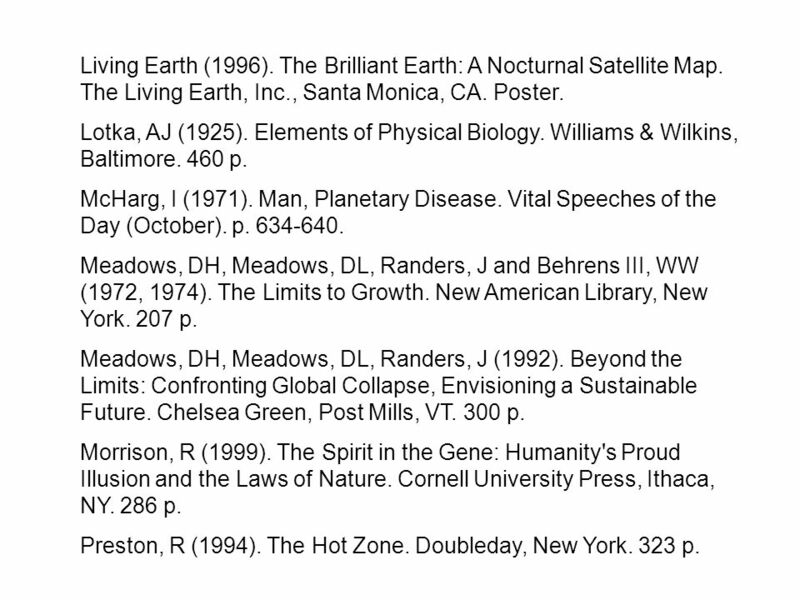 791 p.
Living Earth (1996). The Brilliant Earth: A Nocturnal Satellite Map. The Living Earth, Inc., Santa Monica, CA. Poster. Lotka, AJ (1925). Elements of Physical Biology. Williams & Wilkins, Baltimore. 460 p. McHarg, I (1971). Man, Planetary Disease. Vital Speeches of the Day (October). p Meadows, DH, Meadows, DL, Randers, J and Behrens III, WW (1972, 1974). 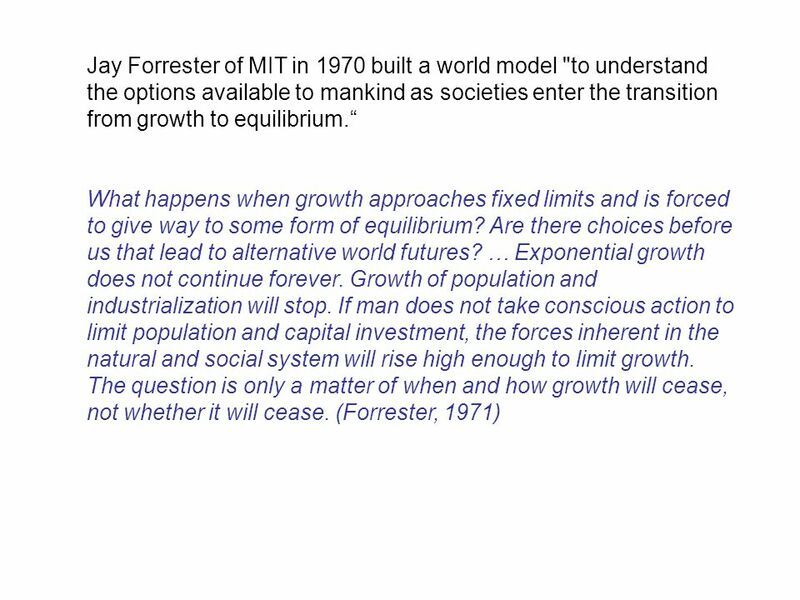 The Limits to Growth. New American Library, New York. 207 p. Meadows, DH, Meadows, DL, Randers, J (1992). Beyond the Limits: Confronting Global Collapse, Envisioning a Sustainable Future. Chelsea Green, Post Mills, VT. 300 p. Morrison, R (1999). The Spirit in the Gene: Humanity's Proud Illusion and the Laws of Nature. Cornell University Press, Ithaca, NY. 286 p. Preston, R (1994). The Hot Zone. Doubleday, New York. 323 p.
Romer, RH (1985). Energy: Facts and Figures. Spring Street Press, Amherst, MA. 68 p. Spemann, H (1938). Embryonic Development and Induction. Yale Univ. Pr., Newhaven, CN. 401 p. Simmons, MR (2000). Energy in the New Economy: The Limits to Growth. Energy Institute of the Americas, Oklahoma City (October 2). 1 p. Tainter, JA (1988). The Collapse of Complex Societies. Cambridge University Press, UK. 250p. Weatherford, JM (1994). Savages and Civilization: Who Will Survive? Crown, New York. 310 p. White, L (1949). The Science of Culture: A Study of Man and Civilization. Farrar, Straus & Co. New York. 444 p. Wiener, N (1950, 1954). 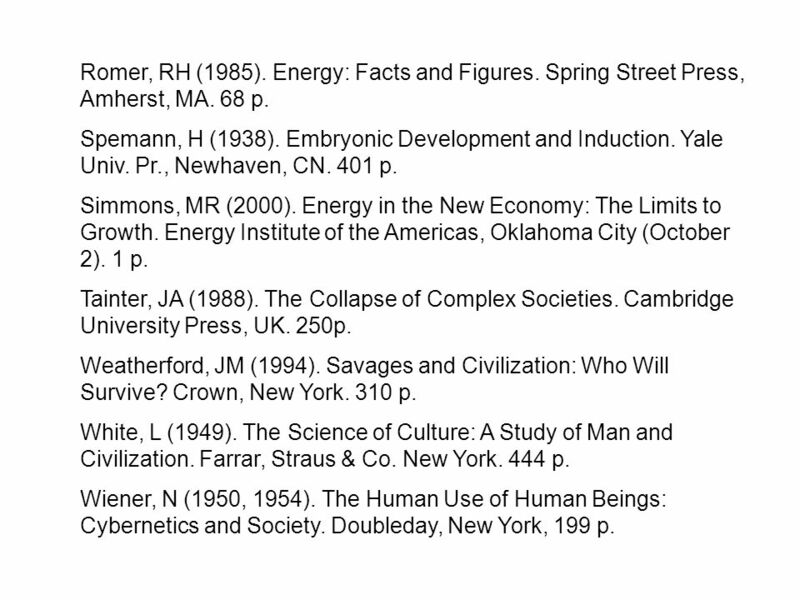 The Human Use of Human Beings: Cybernetics and Society. 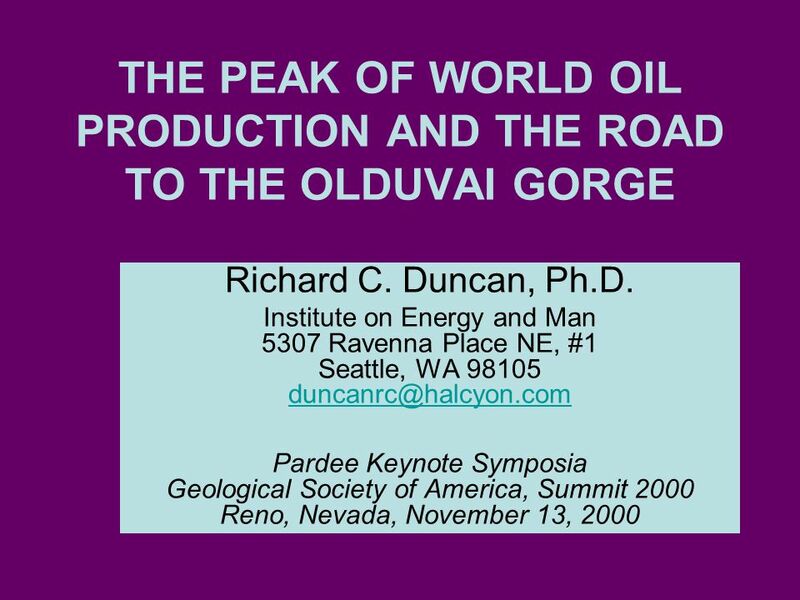 Doubleday, New York, 199 p.
Download ppt "THE PEAK OF WORLD OIL PRODUCTION AND THE ROAD TO THE OLDUVAI GORGE"
The Global Mid-Point of Conventional Hydrocarbon Production Aaron Dunlap PEAK OIL. Inflation Cycles In the long run, inflation occurs if the quantity of money grows faster than potential GDP. In the short run, many factors can start. 8 Potential GDP and the Natural Unemployment Rate CHAPTER. The Basics of Economic Growth Economic growth is the sustained expansion of production possibilities measured as the increase in real GDP over a given. Hans Timmer and Richard Newfarmer World Bank December, 2006 Global Economic Prospects, 2007 Managing the Next of Globalization. INTERNATIONAL ENERGY AGENCY AGENCE INTERNATIONALE DE LENERGIE Energy Technology Policy Progress and Way Forward Fridtjof Unander Energy Technology Policy. 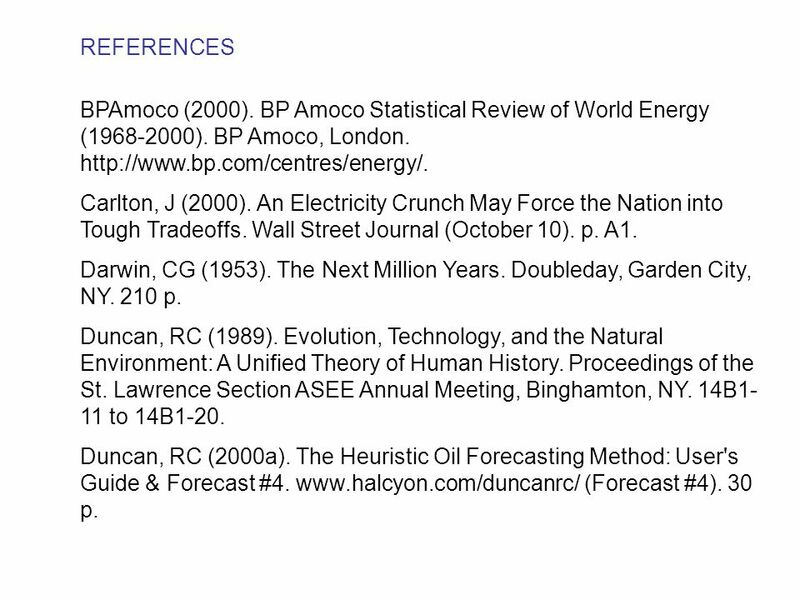 Oil Market Structure and Prices: A Behavioral Analysis Massood Samii, Ph.D.
1 of 59 PART III The Core of Macroeconomic Theory © 2012 Pearson Education, Inc. Publishing as Prentice Hall CHAPTER OUTLINE 11 Aggregate Demand in the. 1 Economics and Limits to Growth: What’s Sustainable? Dennis Meadows at The Population Institute Washington, DC October 6, 2009. Copyright © 2008 Pearson Addison-Wesley. All rights reserved. Chapter 12 Keynesian Business Cycle Theory: Sticky Wages and Prices. CHAPTER 15: Tests of Significance: The Basics Lecture PowerPoint Slides The Basic Practice of Statistics 6 th Edition Moore / Notz / Fligner. © 2010 Pearson Education Canada. Real GDP per person in Canada tripled in the 50 years between 1958 and What has brought about this growth in. 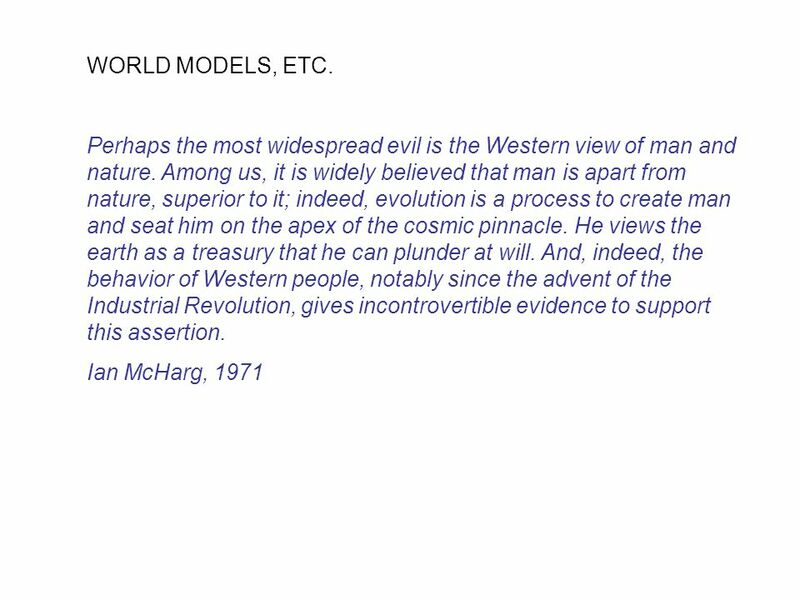 1 © ©1999 South-Western College Publishing PowerPoint Slides prepared by Ken Long Principles of Economics 2nd edition by Fred M Gottheil.